If you've poked your head into the WTB forum over the past year, you may have seen me desperately bumping a "WTB: P88 wood grips" thread I posted a while back. Won't be doing that anymore. I came across these Nill grips on a German site. They cost me $40 shipped from Germany. I never thought a set of grips would prove harder to find than some of the more obscure guns I'm into, but finding these has been a long time coming. 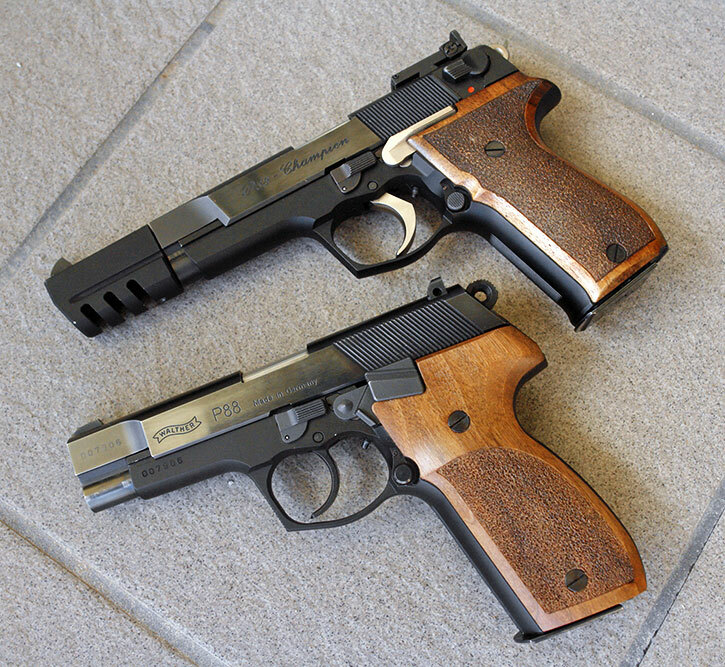 Wood P88 Compact grips are relatively easy to come by, but Nill stopped making sets for the full-size P88 a few years ago and they just never show up anywhere for sale. 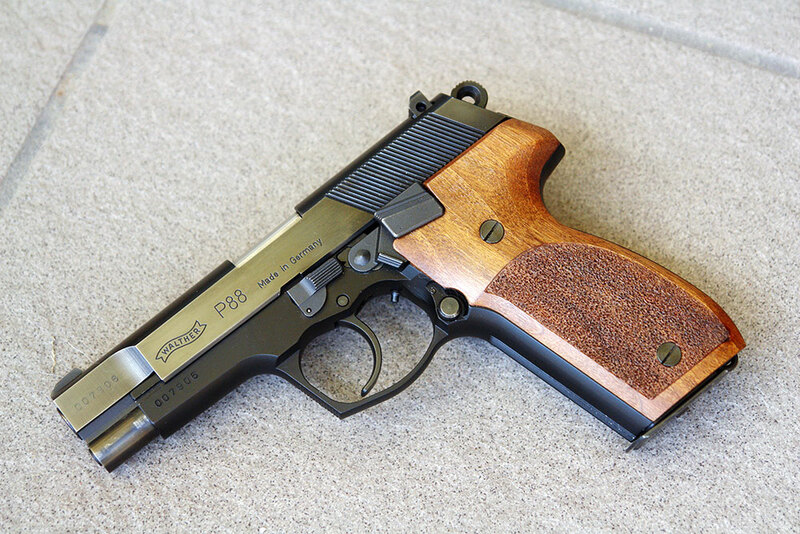 I think a gun as nice as the P88 deserves some fine wood shoes, don't you agree? Edit: For what it's worth, I don't think these add to the width of the grip. In fact, they feel a bit thinner than the original plastic, I think. E.T., searcher451, Captatnman and 3 others like this. Last edited by lifesizepotato; 06-27-2013 at 05:10 PM. A beautiful gun made better by beautiful grips - congrats! Yikes, that's a deal and a half! Does the supplier have more at that price? I may have to consider a set if they do. Unfortunately, it was just one guy selling a new old-stock pair he had. I was pretty excited about the price, considering the last figure I'd seen in the states was around $200. A beautiful P88, and the grips really bring out the perfect fininsh on the pistol ..
"One can never be too careful when handsome men in tuxedo's carry Walthers"
Feedramp's response kicked this one back into the blue again, and looking at those photos again reminds me about how cool the P88 is, especially with the Nill grips. What an elegant pistol. It's really too bad that Walther didn't continue to work out the issues and bring it out as a fully realized firearm, similar to the P5. What an elegant pistol. It's really too bad that Walther didn't continue to work out the issues and bring it out as a fully realized firearm, similar to the P5. My feeling is that the P88 is Walther's "last hurrah" in many ways. With what must have amounted to tons of Deutsche Marks in design & R&D costs, a failed bid at a huge military contract, and the "new kid on the block" P99 with its plastic frame and inexpensive production criteria... it all spelled the end for the pistol that Earl Sheehan dubs "the finest 9mm handgun ever produced." Whether you agree on what Mr. Sheehan says or not, the P88 is indeed an elegant pistol, like a fine Swiss watch with its myriad of tiny parts that work in concert with one another - on par with anything I own or have had opportunity to shoot, and that includes my P5... For a pistol that needs a "working out of the issues" (I disagree), a perusal of our own P88 sub-forum has a scant offering in the way of any problems with the platform. Mine, and pretty much everyone else who has ever posted here - going back to 2002, has been rock solid, and I feel fortunate to be in possession of the 1034th of 9,894 total P88 pistols on the planet. If you take a look at the design of the P88, from start to finish, you'll see a variety of subtle changes, tweaks here and there, attempts to fine-tune the pistol, to get it exactly right. I don't think they ever did, and we may well have to disagree about that statement. Even the P88C, which looks much the same on the outside, is a different pistol and not merely a compact version, in my view. This isn't a criticism of the P88, mind you. I just don't think that it was ever fully realized. Had it been, there would be plenty more of them available in the marketplace today. Oh, the tweaks were here, there and everywhere for sure... Tall sights, small sights, long trigger bar, short trigger bar, and others, but where I differ is that I wouldn't exactly term them as "issues." Just a design that hadn't yet been finalized, just as many other pistols that had seen tweaks, i.e., "variations" throughout their manufacturing run. The Modell 8 and PP-series come to mind here. It should be noted that like the others, the P88 still functioned in all iterations that the public was offered. Even the P88C, which looks much the same on the outside, is a different pistol and not merely a compact version, in my view. This isn't a criticism of the P88, mind you. I just don't think that it was ever fully realized. Had it been, there would be plenty more of them available in the marketplace today. I just feel that Walther's primary outlook on the P88 was to be a military/police pistol first, and a civilian sidearm second... When the military/police thing didn't happen, perhaps they dreamed they could salvage the platform in civilian sales, but at the same time with the P99, they knew how much more inexpensively they could produce a very good modern police/civilian pistol. Walther then made their peace with the fact that the P88 project, which had been an extremely pricey endeavor through the XM9 trials and at less than 10K pistols into a civilian marketing strategy, wasn't ever going to turn a profit. Similarly, H&K decided to shelve it's awesome P7 pistol because they were just too expensive to produce, as folks were investing in the new poly-frame USP pistols. On another forum, a member who was employed at H&K at the end of the P7s production stated that for the cost of machining a single P7 slide, they could produce two finished USP pistols. I do believe that the same general factors played into the demise of the P88. ETA: Of course, none of the above jabber should obscure the fact that the P88 is one heck of a fine pistol - in the echelon of the finest 9mm pistols made by any manufacturer. feedramp, Jimmo952 and DeutschlandUberAlles like this. Last edited by AoxoMoxoA; 09-10-2013 at 01:34 PM. I believe your post hit the nail right on the head AoxoMoxoA.